Geddes Onehunga Auckland Towing & car recovery services. We tow broken down cars on our tow truck, we also fix cars. Taking care of cars has been in our family’s blood for more than 45 years. Geddes has been in the automotive business of fixing cars for more than 45 years. Our tow truck has a sliding deck. This makes it easier for us to load your car safely. Once your car has been rolled onto the deck the hydraulics raise the deck and your car up onto the back of the tow truck. We then tow your car to the address you request. If you request we will tow cars to our workshop for a no obligation quote or estimate for the repairs. A customers car that had broken down & towed to our workshop for repairs. 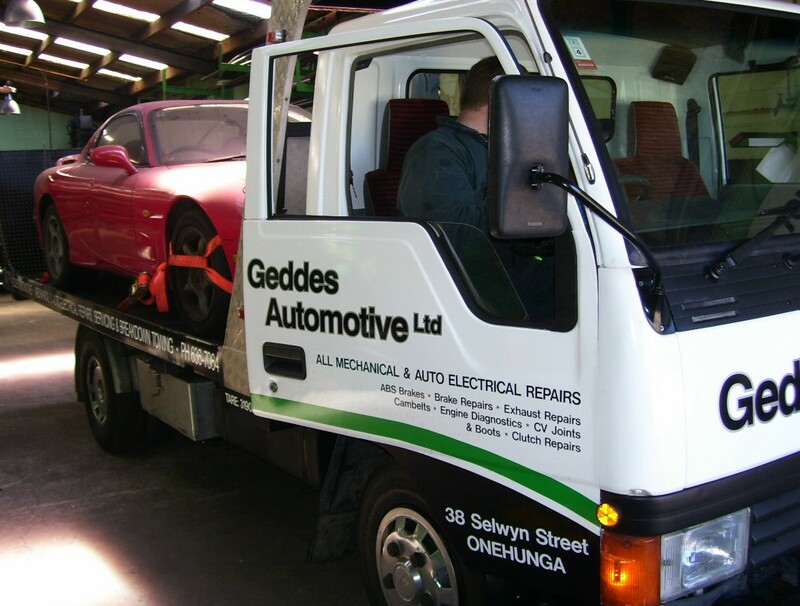 Geddes Automotive Limited is a “VEHICLE RECOVERY LICENCED” tow truck operator. Our drivers have their “VEHICLE RECOVERY” tow truck drivers licences.